What is it about things strapped to rockets that fascinates people so much? There’s the movie Rocketeer where a man straps himself to a rocket. There’s the app ST Action Pig that features a pig strapped to a rocket jet pack. And now the company BeTomorrow has released an action, accelerometer game for the iPhone, iPod Touch, and iPad that features a bird strapped to a rocket, which is aptly named Rocket Bird 3D. You’ll fly Rocky the Rocket Bird through a seemingly never-ending landscape filled with various obstacles like barnyards, cows, windmills, farms, fences, and trees. Control where Rocky turns by tilting your device left or right. Collect the different stars along the way to fill up Rocky’s tank so you can play some more. If you make Rocky crash, game over. If your fuel runs out on the depicted tank, game over. Last as long as possible and score points by distance covered. Send your score to the online global leaderboards or your Facebook wall and try again. Rocket Bird 3D is straightforward, pick-up-and-play game. It’s perfect for the casual gamer who can’t be bothered by complicated instructions and tutorials. Controls are also dead-easy to navigate. Developers even threw in a sensitivity adjustment feature. I think you’ll also appreciate the inclusion of leaderboards because it makes for addictive gameplay. As for audio, it is decent for the game. There is an extra music pack ($0.99) that comes with 4 music tracks that I didn’t splurge on, but you might consider it worthwhile. If you end up buying the music pack and regret your purchase, there’s a button so you can change the music back to its original state. Graphics and animations are colorful and fun. The graphics don’t look as slick as my other favorite accelerometer-based game ST Action Pig. Rocket Bird 3D appears more minimalist and the drawings have less personality overall, but it is 3D (and not 2D). Animation is also more limited than what ST Turbo Action Pig offers. The majority of the animations are Rocky flapping his wings or the flares from his rocket pack. Those who want complex strategy games should look elsewhere. 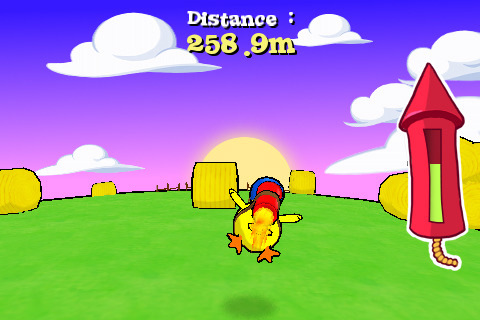 The gameplay in Rocket Bird 3D is satisfying but may become repetitive. To break up the repetition, developers could add different, collectible items. I wouldn’t mind additional obstacles like ducks flying up. Additional backgrounds with various seasons and times would also be nice. Developers could also integrate with OpenFeint and create achievements. For example, a user could win a Chickadee award after flying 200 miles. It would be great if little Rocky had free power-ups too. Rocket Bird 3D has the potential to become a smashing success. The game is free for the first 3 levels of play. You certainly can’t beat free and the only thing it will cost you is your time. So give it a try! If you want a groovier soundtrack or the 4th Turbo Rocket level, you’ll have to drop $0.99 for each (or $1.98 for both). AppSafari review of Rocket Bird 3D was written by Linda Ta on May 13th, 2010 and categorized under Action, App Store, Free, Fun, Games. Page viewed 4462 times, 2 so far today. Need help on using these apps? Please read the Help Page.